How to invoice us How does free fax to email work? Start receiving faxes in your email right away. 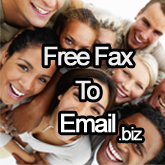 Fax2Email is FREE for the recipient! Instant fax to email - complete the short form on the left and your 086 fax number will be up and ready to use as soon as you hit the send button. Works with all email accounts including Facebook, Hotmail, Gmail and Yahoo! Manual Fax to email number generator. Temporary technical issue: The automatic fax number generator is offline. Please complete the form below to receive a fax number by email. How does free fax to email work? Apply for a free fax to email number. Immediate activation of your fax2email number. Your fax number is activated immediately when the server is running, we apologise about the inconvenience this causes. We will manually activate your number as soon as we can.